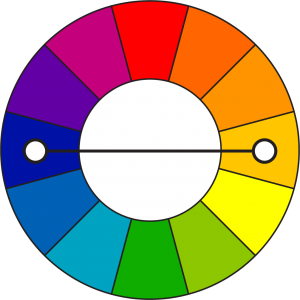 On a color wheel, complementary colors are in exactly opposite positions. For example, blue and orange in the color wheel to the right. In addition, the two colors should mix to form a neutral color. Because complements have such a strong contrast they are often used when a vibrant look is needed. Complementary colors should be used sparingly though as they the combination can be overwhelming. If you want a strong contrast, but not quite as strong as complementary colors, take a look at split complementary colors. And you probably don't want to use complements for text. It's very difficult to read when a color text is placed on a background of its complement.